The price is great for what you get. There is even a stove, sink and other appliances in the room we stayed in. Also, shampoo, soap and towels were provided. 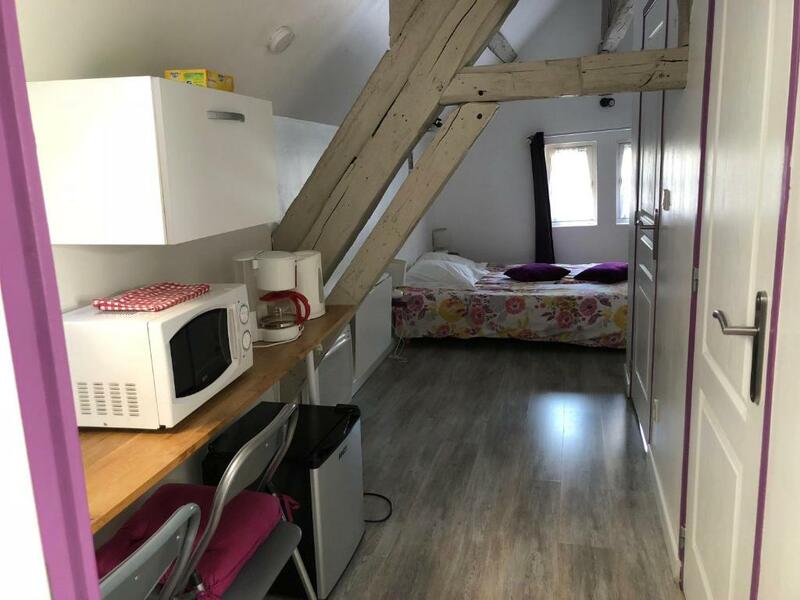 The apartment is quite cute as it is in a half-timbered building and had a comfortable patio attached to it with a hammock and a picnic table for eating outdoors! Most anything we needed was in the apartment, and it was clean with little extras like salt/pepper, shampoo and body washing gel, etc. The bed was comfortable, too. It is located just at the edge of all the old town "must sees." This meant we were able to spend a night there en route to other destinations and feel that we saw quite a bit. The landlord was responsive to all questions, and the check-in/check-out was easy. We would certainly stay there again. Central location, parking nearby, nicely equipped little kitchen, a very nice flat. Great central location. Quaint old building nicel modernised. Very competitive price. We had to call a telephone number to get access to property. No one available. The apartment was on the top floor under the roof. We had to climb and drag our luggage up three flights of steep steps. Very hot under the roof and there were no maps of orientation. Overall, for older people not safe, but honeymooners might find the apartment interesting. Facilities were fantastic and the size of the apartment was very spacious! Great value for money. Would have loved to stay longer. And I would definitely stay again. The hammock was a nice touch! The property is in a perfect location, you could just park the car in the free parking spaces close by , and walk to the centre of the city . The room is clean, quiet , minimal decor and the space is well used . 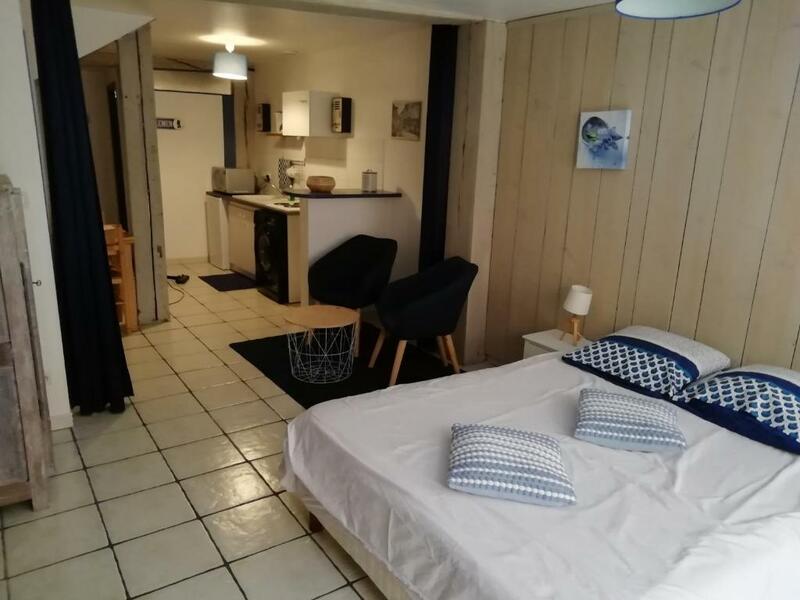 One of our top picks in Troyes.Appart'Hotel Troyens is a self-catering accommodations located in the city center of Troyes. It offers free WiFi and is only 1,950 feet from the Modern Art Museum. The apartments feature a flat-screen TV and a bathroom with a bath or shower. The kitchenette includes a refrigerator, stovetop and a microwave. Restaurants, bars and shops can be reached by foot. Cathedrale Saint-Pierre-et-Saint-Paul is located 1,500 feet from the property. Free parking is also available. Troyes Train Station is 1.2 mi away. This is our guests' favorite part of Troyes, according to independent reviews. 뀐 Located in the top-rated area in Troyes, this property has an excellent location score of 8.3! When would you like to stay at Appart Troyens1? Located on the first floor, this apartment features a flat-screen TV and a bathroom with a bath or shower. The kitchenette includes a refrigerator, stovetop and a microwave. Located on the second floor, this room features tea/coffee making facilities, a flat-screen TV and a private bathroom with a bath and free toiletries. Located on the first floor, this apartment features a flat-screen TV and a bathroom with a shower. Located on the second floor, this room features tea/coffee making facilities, a flat-screen TV and a private bathroom with a shower and free toiletries. Née à Troyes l'immobilier m'a toujours passionné aujourd'hui mon plaisir dans cette activité est d'accueillir des gens du monde entier qui viennent séjourner dans mon établissement. Quartier très calme situé à cinq minutes du centre ville à pieds, sur place vous trouverez une excellente pizzeria, une alimentation de proximité, un bureau de tabac, un parc rempli de verdure et de jolie fleurs pour se balader, tout proche de la cathédrale venez vite la découvrir. Museums and churches are nestled among wooden-framed houses in Troyes’ old town. Stop by the Gothic cathedral and explore the Renaissance buildings found throughout the area. House Rules Appart Troyens1 takes special requests – add in the next step! Please note that cash and French checks are the only accepted methods of payment. Please inform Appart Troyens1 of your expected arrival time in advance. You can use the Special Requests box when booking, or contact the property directly using the contact details in your confirmation. One of the most picturesque neighborhoods in Troyes! Some street noise but not bad. Rear door onto private courtyard wouldn't lock and could not contact landlord to resolve. Needs to provide a hairdryer and update bedding etc so it matches and gives a better impression than being "worn and tired"
Nothing, really. A point to note is the staircase. Winding and may be a challenge to those less nimble on their feet. Lovely flat - good location to walk into centre ; was spotlessly clean. Was very cold in the apartment. There was heating but it took all night to warm up. Ceiling was very low but that comes with an old building. Good for a stop over. Basic property, very close to the town centre, clean, but watch your head !!! We couldn't find the password for WI-FI and couldn't use it. Where to start? Well I could point out a number of issues such as the terrible smell in the shower room despite the air freshner being left out or the extractor fan appearing not to work. But, this place is a health and safety hazzard. The room was on the top (second floor). If there is a fire you will be trapped. There is no fire exit. There is no escape except through a narrow window (if you can get through the gap). This will allow you to fall 2 floors and be trapped as there is no exit except via the downstairs studio also rented out. As an additional hazard an extension cord runs the microwave, kettle and fridge off one plug point. The fridge makes a lot of noise but actually does not keep anything cold. Water leaks from the bathroom tap onto the worktop and presumably to the room below (the bathroom is actually just a 6 foot partition open at the top). The tap, as the plumbing is so badly installed, will not remain open except at the extreme of temptretures as the back of it is jammed against the mirror. However, beware as the historical nature of the house means the room has a large wood bear at perfect height to hit your head as you try and walk around the room. There is no padding or high viz to remind or protect you and I can advise it is easy to make one error in forgetting it for a moment, and you pay a heavy price with a knock to the head. I have taken photos of everything listed above and will pass them to booking.com. I forgot to mention that there appears to be only a battery powered fire alarm in the upstiares hallway (this would be required to be both battery and mains operated if in the UK). I have been unable to add the photos at the time of submitting this review. If there was a ceiling on the toilet room. Better use of the space with maybe a built in wardrobe next to the tv area. The bed was quite basic. Slamming doors from apartments upstairs can be loud and it was quite noisy in the morning. Terrace was a nice area, washing machine a plus!